Cho J, Lee E, Lee S. Upper thoracic spine mobilization and mobility exercise versus upper cervical spine mobilization and stabilization exercise in individuals with forward head posture: A randomized clinical trial. BMC Musculoskel Dis. 2017;18:525. Neck pain is one of the leading causes of disability globally.1 The increasing use of personal technology, such as smartphones and tablets, suggests that forward head posture (FHP) may play a role in the growing prevalence of neck pain around the world.1,2 The use of cervical and thoracic mobilization for treatment of neck pain has been well supported in the literature. The authors of this study directly compared the effects of cervical mobilization plus a neck retraction strengthening exercise to thoracic mobilization plus a thoracic mobility exercise in the management of neck pain with FHP. Methods: Thirty-two subjects, age 20-29, with neck pain were randomized to either the cervical or thoracic management groups (n = 16 in each group). Subjects were excluded for evidence of cervical degenerative disease, neoplasm, history of whiplash or spinal surgery, or neurological symptoms. 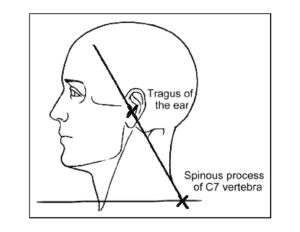 Investigators measured the craniovertebral angle (CVA)(Figure 1), cervical range of motion (CROM), numeric pain rating scale (NPRS), pain pressure threshold at the upper trap, Neck Disability Index (NDI) and global rating of change (GROC) of each subject. Subjects were blinded to purpose of the study and the evaluator was blinded to subject group assignment. 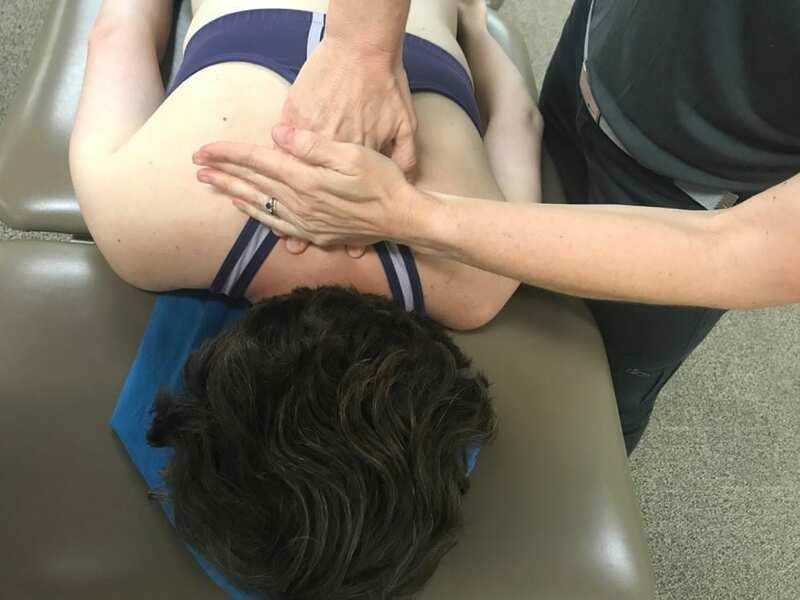 Interventions were performed by a single physical therapist with 13 years of clinical experience and over 300 hours of manual therapy training. FHP is defined as simultaneous upper cervical extension and lower cervical flexion. Consequently, the investigators in this study aimed to improve the CVA in the cervical management group by improving upper cervical flexion. 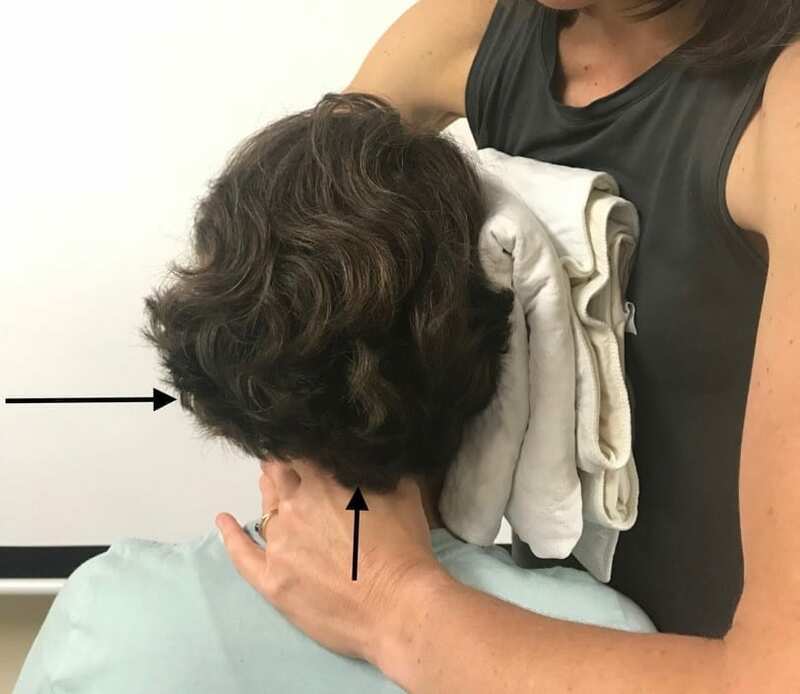 For the cervical mobilization, the physical therapist applied a stabilizing hand on C1 and mobilized the subject’s occiput into suboccipital flexion. Although the authors described the cervical mobilization as C1 on C2, they described a 1-dimensional C0-C1 flexion mobilization that was performed bilaterally, three times for 30 seconds each (Figure 2). Then each subject was instructed to perform neck retraction in sitting, three sets of 10 repetitions, each with a 10 second hold (Figure 3). Figure 2. Upper cervical (C0-1, the authors of the study call this C1-C2) mobilization. The bottom hand is stabilizing C1. The top hand is performing a flexion mobilization of the occiput using a scooping motion. Investigators have suggested that increasing thoracic spine mobility decreases chronic neck pain.3 Studies have shown increased cervical spine ROM and decreased neck pain in patients who received manual therapy on the upper thoracic spine.4,5 In this study, subjects received a prone dorsoventral mobilization of T1-T2 (Figure 4). Each subject then performed an active upper thoracic extension exercise (Figure 5). Subjects were instructed to perform an upper trunk lift while tucking the chin, thereby engaging the deep neck flexors in an anti-gravity position. The dosing for the mobilization and the exercise was the same as for the cervical management group. Treatment for both groups was performed once a week for four weeks. Follow up evaluation was conducted at six weeks following the initial visit. Figure 4. Upper thoracic (T1-2) mobilization. The bottom hand is on the transverse processes of T2 and the top hand is performing a PA mobilization perpendicular to the thoracic kyphosis. Figure 5. Thoracic mobility exercise. The patient is instructed to tuck the chin and lift the upper body toward the ceiling. Results: The subjects in the thoracic management group demonstrated significant improvements in CVA (p = .042)(3.9o; 95% CI: 1.8, 6.0), cervical extension range of motion (ROM)(p = .016)(7.5o; 95% CI: 3.7, 11.3), NPRS (p = .001), NDI (defined in methods)(p = .004), and GROC (p = .011) at the 6-week follow-up compared to the cervical management group (group x time interaction). The cervical management group demonstrated improvements in cervical extension ROM, CVA, NPRS and NDI, but the improvements seen in the thoracic management group were statistically significantly greater. 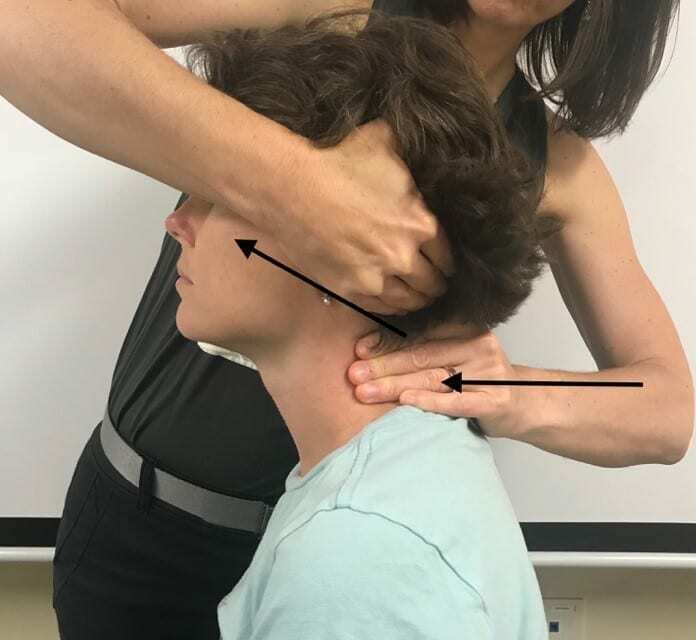 The minimum level of detectable change (MDC) for CVA has been reported as 3.61o.6 Given that the changes in CVA and cervical extension ROM were seen with concurrent improvements in pain and function, one could interpret the head position and neck ROM changes as clinically meaningful. IAOM Commentary: Patients with neck pain often benefit from thoracic spine mobilization for the purpose of improving mobility, as well as for symptom modulation by providing mechanical input to the sympathetic nervous system at the level of the thoracic spine.7 The authors of this study concluded that subjects who received the thoracic mobilization and mobility exercise demonstrated better short-term outcomes for CVA, cervical extension ROM, pain and disability. 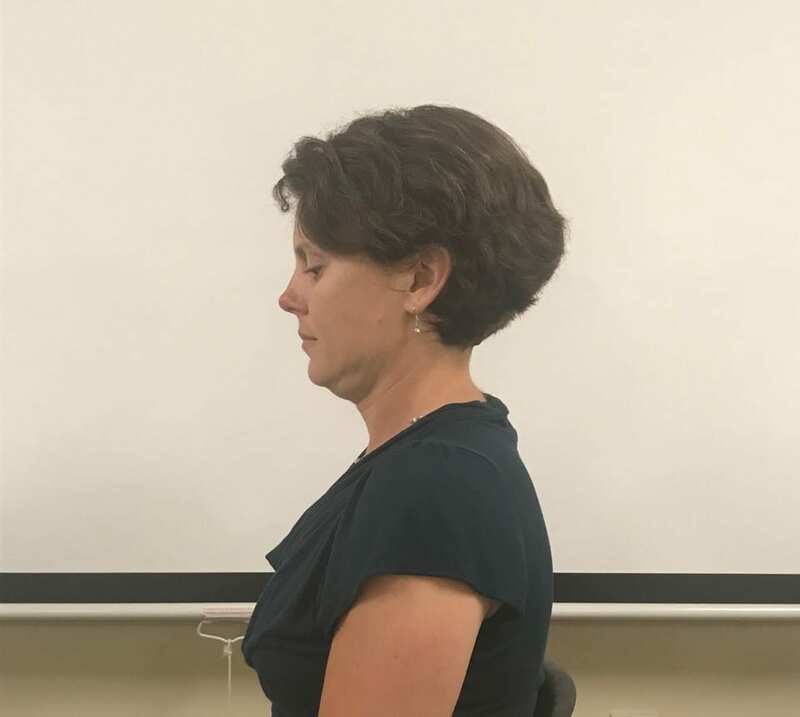 While the authors claimed to target upper cervical flexion strength with the neck retraction exercise for the cervical management group, the thoracic extension mobility exercise given to the thoracic spine management group also incorporated an active chin tuck, thereby strengthening the deep neck flexors (DNF) as well as improving thoracic spine extension mobility. In addition, the intensity of the chin tuck in prone was higher given that it was performed anti-gravity. 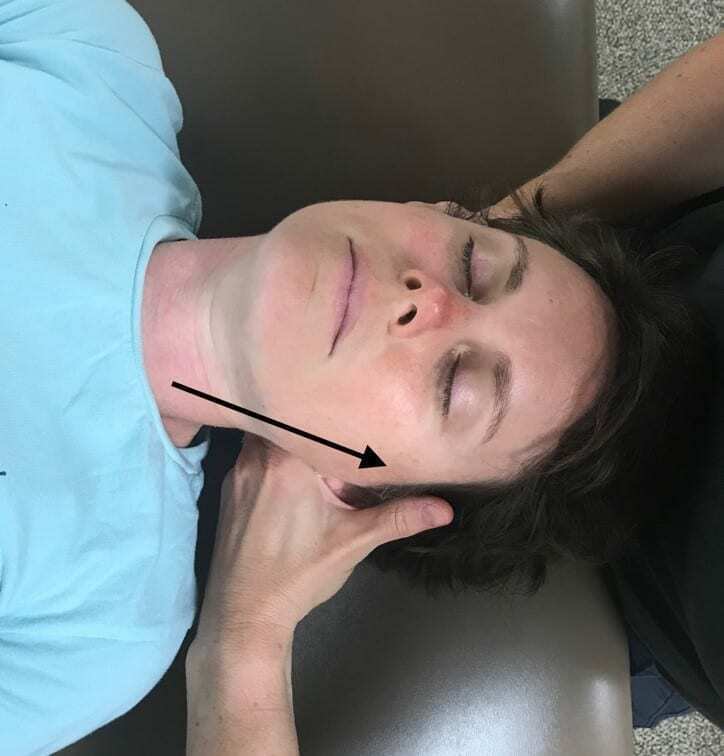 The cervical flexion strengthening exercise performed by the cervical group involved only the chin tuck exercise in sitting. Consequently, it is possible that higher exercise intensity, as well as the combination of DNF strengthening plus thoracic mobility, may have contributed to the difference seen in the thoracic management group. 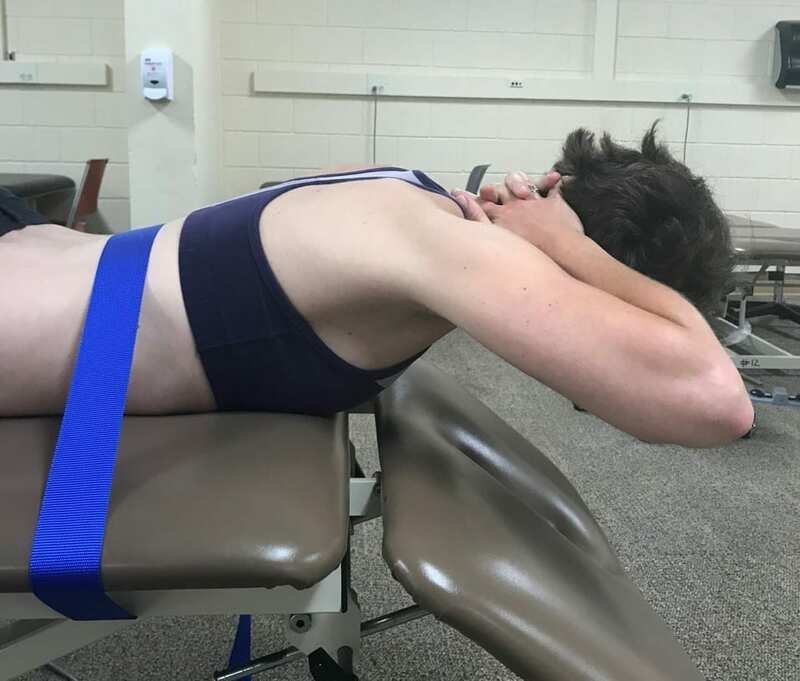 The authors of this study reported that they performed passive physiologic intervertebral motion (PPIVM) and passive accessory intervertebral motion (PAIVM) testing in the cervical and thoracic spine; however, the results of mobility testing were not reported. Consequently, it is not possible to determine if subjects demonstrated upper cervical spine hypomobility. Perhaps C0-C1 hypomobility was not a problem for the patient population in this study. The IAOM claims that a precise, systematic diagnostic process leads the clinician to sound clinical decision making and effective patient management. 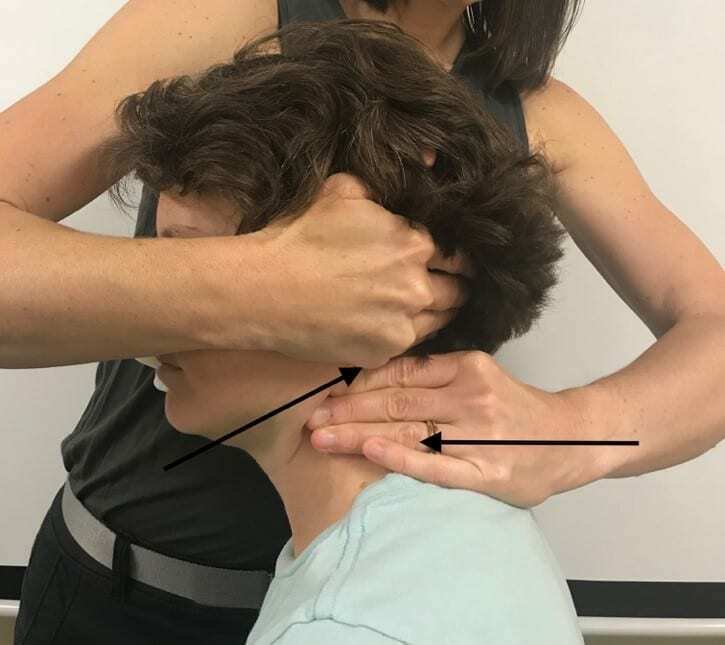 The use of a local exam of the upper cervical spine (C0-2) that includes lateral translation of C1 (Figure 6) as well as a 3-dimensional mobility test of C0-C1 (Figure 7) would improve clinical decision making to determine if segmental mobilization is necessary. If a mobility deficit is identified, treatment could include traction mobilization at C0-C1 (Figure 8), lateral translation mobilization of C1 and a unilateral flexion mobilization of C0 on C1 in an effort to reduce CVA. Figure 6. Lateral translation of C1. The bottom hand stabilizes C2 while the top hand translates C1 and the occiput laterally toward the examiner. Figure 7a & b. 3-dimensional mobility of C0-C1 in flexion and extension. The bottom hand stabilizes C1. The top hand mobilizes the subject’s left occiput into a) flexion (retraction), rotation away, side bend toward and b) extension (protraction), rotation toward, side bend away. Figure 8. C0-C1 traction mobilization. The subject is positioned in slight ipsilateral side bend and contralateral rotation. The radial side of the examiner’s second finger applies traction to the occiput. Given the biomechanical relationship and the regional interdependence of the cervical and thoracic spine, it stands to reason that thoracic spine management should be included in the plan of care for any patient with neck pain. The results of this study support the implementation of such strategies in the care of patients with neck pain and FHP. GBD 2015 Disease and Injury Incidence and Prevalence Collaborators. Global, regional, and national incidence, prevalence, and years lived with disability for 310 diseases and injuries, 1990-2015: A systematic analysis for the Global Burden of Disease Study 2015. Lancet. 2016;388(10053):1545-1602. Durall C. Therapeutic exercise for athletes with nonspecific neck pain: A current concepts review. Sports & Health. 2012;4(4):293-301. Masaracchio M, Cleland J, Hellman M, Hagins M. Short-term combined effects of thoracic spine thrust manipulation and cervical spine nonthrust manipulation in individuals with mechanical neck pain: A randomized clinical trial. J Orthop Sports Phys Ther. 2013;43(3)3:118-127. Dunning J, Butts R, Mourad F, Young I, Fernandez-de-Las-Penas C, Hagins M, et al. 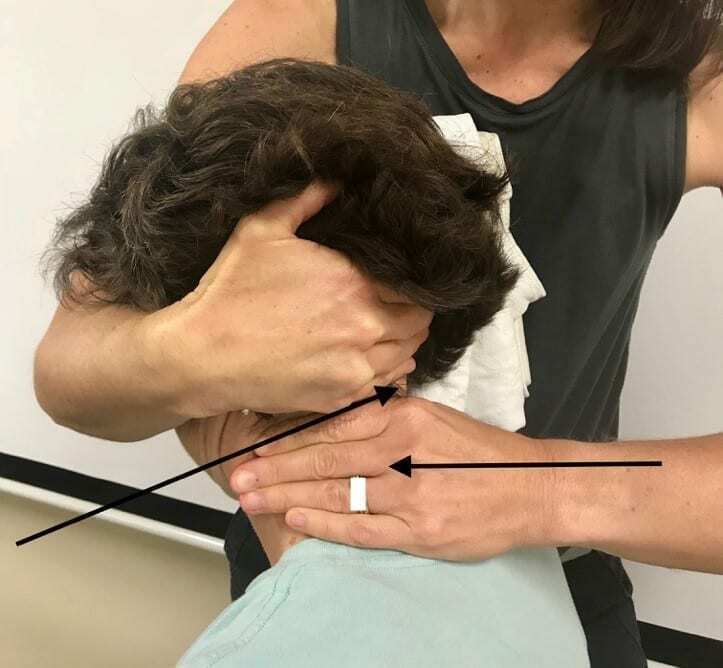 Upper cervical and upper thoracic manipulation versus mobilization and exercise in patients with cervicogenic headache: A multi-center randomized clinical trial. BMC Musculoskelet Disord. 2016;17:64. Subbarayalu A. Measurement of craniovertebral angle by the Modified Head Posture Spinal Curvature Instrument: A reliability and validity study. Physiother Theory Pract. 2016;32(2):144-152. Sueki D, Chaconas E. The effect of thoracic manipulation on shoulder pain: a regional interdependence model. Phys Ther Rev. 2011;16(5):399-408.